According to the German mobility organisation ADAC (Allgemeiner Deutscher Automobil Club), modern diesel and petrol cars tested in real world conditions out-performed regulatory requirements. 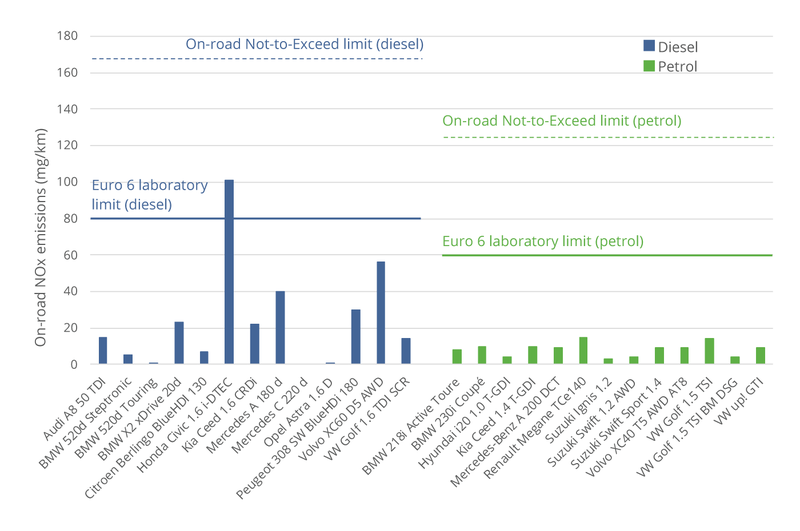 Until September 2017, car emissions testing in Europe was limited to laboratory testing that did not fully represent the level of pollutant emissions from new car models. Car buyers therefore could not compare petrol and diesel models or makes due to insufficient reliable, publicly available data on realistic driving conditions. Then, in September 2017, the European Commission started to implement new emissions testing procedures that combined improved laboratory tests and new emissions testing procedures based on real driving situations. Thanks to the Real-Driving Emission (RDE) test and the Worldwide Light vehicle Test Procedure (WLTP), car buyers can check emissions levels of nitrogen oxides (NOx) and particulates for new vehicles on the market. In addition, from September 2019, car manufacturers are required to publish emissions testing results of all new cars certified as ‘Euro 6d-temp’, in conditions equivalent to driving in the real world as well as in the laboratory. A number of these tests were done at low temperatures (between 0 and 8°C), a range at which some cars have previously not met the limits. The fact that these modern diesel cars were able to comfortably achieve very low levels of NOx in a variety of conditions also highlights the improvements that have been made, even since the introduction of the first Euro 6 cars in 2016. With modern diesel and petrol cars now performing similarly, as regulations intended, consumers can compare vehicles based on their needs, rather than on the level of emissions these cars generate. There has been growing concern regarding the increase in overall CO2 emissions from cars, partly due to the increase in sales of heavier SUVs (sport utility vehicles), but also due to the decline in sales of diesel cars, which emit less CO2. Whenever it makes economic and practical sense to the buyer, and if there is little or no difference in pollutant emissions (information should be available in vehicle brochures from your dealer or online), choosing a new diesel car will help bring down CO2 emissions levels in comparison with a petrol car’s performance – a ‘win-win’ for buyers and the climate. How have emissions from modern diesels been substantially reduced? How modern diesel cars help lower CO2 emissions Diesel is key to sustainable transport. Its high fuel-efficiency, which produces lower carbon dioxide (CO2) emissions, and advanced emission controls make it suitable for achieving CO2 reduction targets and climate change goals. According to the Global Carbon Project’s report of November 2017, after a stable three-year period, global CO2 emissions are set to rise by 2%. This is mostly due to a global increase in the use of fossil fuels. Therefore, in order to prevent the negative impacts of climate change, reducing CO2 emissions is a top priority in Europe. By signing the Paris Agreement, the EU reaffirmed its commitment to keep the global temperature rise below 2°C compared with the average temperature in pre-industrial times, and to pursue efforts to limit the temperature increase even further to 1.5°C. These demanding measures to reduce the impact of transport on the environment require the use of energy sources that emit less greenhouse gas (GHG), such as diesel. Modern and cleaner diesel cars are an element of the move to improved air quality in Europe. In November 2017, the European Commission’s Clean Mobility Package set CO2 emission performance standards for new passenger cars and other light-duty vehicles for the next decade. A target for new passenger cars and vans was proposed to provide stability and long-term direction: if adopted, the average CO2 emissions of new cars in 2030 will have to be 30% lower than in 2021. The intermediary target of 15% to be achieved by 2025, also compared with 2021 levels, is proposed to further ensure that the industry is going in the right direction. Alongside these demanding regulatory measures in the EU, diesel powertrains play a significant role in meeting our global climate change targets. In addition, diesel engines are highly efficient and emit less CO2 than their counterpart petrol engines. [caption id="attachment_423" align="aligncenter" width="1080"] The climate agreement signed in Paris commits the EU to keeping the global temperature rise below 2°C[/caption] Diesel is an essential part of Europe’s sustainable transport future The new Worldwide harmonised Light vehicle Test Procedure (WLTP) has been introduced since September 2017 to provide more realistic measurements of CO2 emissions of cars and vans. This test is progressively replacing the outdated New European Driving Cycle (NEDC). The changing mix of vehicles in the UK is directly contributing to increased CO2 emissions, putting the chances of meeting the EU’s CO2 targets at risk. According to a 2018 report in the UK, the average new car’s CO2 emissions rose 0.8%, which represents the first increase in more than a decade. With increasingly challenging EU targets, an annual CO2 emission reduction of 5.9% would be needed in order for vehicles to emit less than 95g of CO2 per kilometre by 2020 – the limit required to meet this EU goal. Modern and cleaner diesel cars can provide the foundation to meet Europe’s air quality and environmental objectives. The efficiency of modern diesel cars can contribute to meeting CO2 targets and to mitigating GHG emissions from road transport. Diesel cars typically have 15% lower CO2 emissions per kilometre than equivalent petrol-powered cars. The increasing sales of petrol cars in the UK is directly contributing to increased CO2 emissions, putting the chances of meeting the EU’s CO2 targets at risk. How our innovations will continue to reduce CO2 emissions in the future Modern diesel cars represent a new generation of vehicles built with an emissions control technology that converts up to 99% of combustion engine exhaust pollutants (hydrocarbons, carbon monoxide, oxides of nitrogen and particulates), which improves air quality and helps the EU achieve its sustainability targets. Diesel Particulate Filters (DPF) and Selective Catalytic Reduction (SCR) systems have been created to further reduce harmful emissions: the former by trapping the soot and other combustion particles and the latter through converting nitrogen oxides into inert diatomic nitrogen – the major (78%) component of ambient air – and water. Diesel cars typically have 15% lower CO2 emissions per kilometre than equivalent petrol-powered cars Diesel technology has a long history of innovation and continuous improvements in a highly regulated automotive market. Due to their modern particulate filters and catalysts, diesel cars are now cleaner than ever before. The diesel industry continues to invest substantially in research, innovation and development to further improve engine efficiency and reduce harmful emissions, making diesel a sound investment for motorists for decades to come.